News reaches me of updates to the BIFFA BRYANT affair, and of an altercation involving CHRIS FRAUD (late of this parish), Charlie MOTORMOUTH McDONALD (attempted deserter from the trenches) and Howard JUDGE DREDD FULLER (DWP Branch Chair of little note). Those with long memories will recall that Bryant was elected to the IR GEC but subsequently sacked for thumping a workmate. Seems he was a gatecrasher at an office party and launched his assault following a self-inflicted overdose of brown lemonade. He is appealing his dismissal on spurious technical grounds, but the expectation is that even if he won at an ET, he wouldn't be re-employed in the Service. Of greater interest to the members is the political intrigue the situation has caused: normally, a GEC vacancy created by somebody leaving the Service would be filled by either call-up or by-election. Traditionally, in most groups, if the vacancy occurred before Xmas there would be a by-election, or if later, call-up. However, BIFFA is refusing to walk, despite the fact that he can no longer represent the members who elected him. Now why should this be, and whose interests does it serve? BIFFA could argue that as he's appealing (but not very), he should remain in his elected post. LEFT UNITY, in which Clive is a leading IR light, don't want to declare a vacancy because there is a knife edge split with IRMF: call-up would mean TED EUERS gets the post, who incidentally is also confident that he would win a by-election. This would mean LU lose their majority. Inevitably, complaints about the situation have fallen on deaf ears (M. Serwotka), as the liberated documents below illustrate. Our LU leadership is unwilling to grasp the nettle and are relying on the legal profession to tell them what they want to hear and weasel their way out of getting shot of their comrade. I recall that Mark's predecessor had a predilection for treading this path. Well paid legal buzzards will always give you a coincidental opinion to your own. I have been asked to write to you by my Branch Committee to express our disgust at the actions of a GEC member at the recent Group Conference in Brighton. Paul O'Connor (GEC Member Constituency A) used the rostrum to rally support for a political ally, disregarding any rule of behaviour that member expect from their elected representatives. To discuss any Personal Case from the rostrum is a total breach of the trust placed in us by our members. To use his position to claim that the PCS Reps dismissal was purely political rather than a decision based on his having allegedly assaulted a PCS member whilst on Departmental premises is appalling. Also the actions of some delegates on hearing of Clive Bryant's re-election were equally disgraceful and should have been stopped by the Chair. 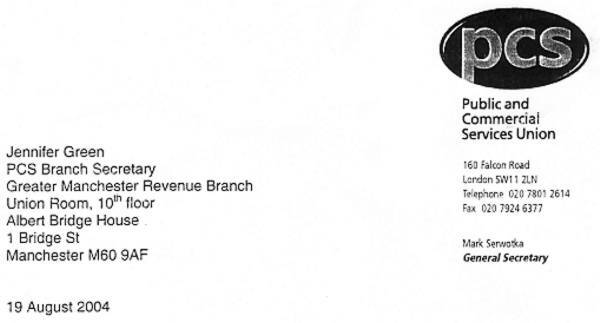 Thank you for your letter of 8 July 2004 , on behalf of your Branch Executive Committee. The first matter you raise is Paul Connor's address to the recent Group Conference. I cannot comment on this, as I was not present and therefore did not hear what he said. The second matter you raise is the issue of violence. I can assure you that I believe that there is no place for violence under any circumstance in the trade union movement or in the workplace. The fact that Clive Bryant remains a member of the GEC is not due to what you describe as a bending of Union rules, but indeed quite the opposite. PCS has received written legal advice to the effect that once an individual is elected to the Group Executive Committee, that individual cannot be removed without a disciplinary process. This advice is consistent with that received in other cases where one party has sought to remove another from union office without recourse to the Rule 10 disciplinary process. Any attempt to remove a person from union office outside of the Rule 10 process in not only in breach of union rules, but is also potentially unlawful. I am sure you will also be aware that a union member who has been dismissed remains a PCS member up until the point that all appeal processes have been exhausted. Finally, I need to point out that your letter as it stands covers several issues, and it is not clear which of your complaints relates to Rule 10. I have enclosed for you a copy of Rule 10, so that you can clarify who you are complaining about, and frame any complaint you wish to make with reference to this rule. Further to my letter of 19 July 2004 , I would firstly like to thank you for your prompt reply and the suggestions contained within. On behalf of my Branch Executive Committee I would like to lodge 2 separate rule 10 complaints with you. The first complaint relates to the actions of Paul O'Connor (GEC member) at the recent Group Conference in Brighton. Whilst responding to debate on behalf of the GEC on a pay motion, he used the rostrum as a platform to rally support for a political ally. He abused his GEC position to speak to conference, claiming that the dismissal of a PCS Official (Clive Bryant) by the Board of Inland Revenue was political rather than a decision based on his alleged assault of a PCS member. This showed a complete disregard of the standard of behaviour that members rightly expect from their elected representatives. To discuss any Personal Case in such a public forum is a total breach of the trust placed in us by our members. How can any member believe that the details of their personal case will be kept confidential, when a GEC member sees fit to publicly reveal the details of this case? Naming of the member who was assaulted was also totally appalling and I imagine very distressing for him. We believe that this incident has brought PCS into disrepute. The second complaint relates to Clive Bryant and his alleged assault on a PCS member. The Board of the Inland Revenue upheld the complaint made against Clive and dismissed him. This means that he is not allowed on Revenue property to speak to either members or management, cannot negotiate at any level with the Department, cannot deal with any personal cases and in short cannot fulfil any of the duties of a GEC member. Whilst I accept that National rules allow for a member to retain membership until all avenues of appeal have been exhausted, they do not allow for that member to hold Office higher than at Branch level. Rule 69 of the IR Group Rules states that the GEC should interpret where the Rules are silent, subject to NEC agreement. This means that the issue of whether Clive retained his GEC seat should have been decided at a GEC meeting and then passed to the NEC for ratification. It clearly does not mean that the whole issue be passed to the National President for a ruling before the GEC has had chance to discuss it. PCS cannot be seen to condone violence against its members by anyone - and certainly not from its own reps. To keep Clive Bryant as a GEC member is condoning his actions. By his own hand Clive has shown that he is not a fit person to hold any PCS office. Can you please now take these two complaints to the NEC as per rule 10.2 and report back to us what decision if any will be taken? Thank you for your faxed letter of 10 August. I can confirm that I will be dealing with your complaint on behalf of your Branch Executive Committee against Paul O'Connor under Rule 10 of the Union's rules. I will be writing to Paul to inform him of the complaint made against him, and will ask a fulltime officer to make the necessary enquiries on behalf of the NEC to establish whether there is a prima facie case to be answered. With regard to your comments concerning Clive Bryant, I cannot see how what you have said could be classified as a complaint under Rule 10. 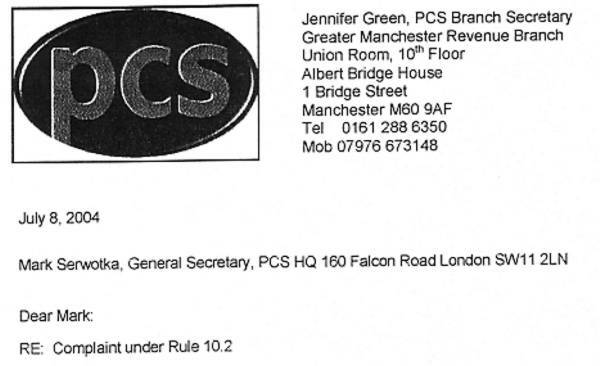 What you have done is to challenge the interpretation of the Rules that we received from PCS solicitors. You are of course perfectly entitled to disagree with our legal advice, but this does not constitute a Rule 10.2 complaint. Questions of interpretation of the Union's Rules are a matter for the President, so I have forwarded your letter to her. I can confirm however that Janice's actions in this matter have been governed by the written legal advice received from solicitors. One way for LUNITY to keep BIFFA on board could have been to offer him a PCS job. But nobody could've been that that stupid, could they? Oh yes they could! Last month he secretly put his name down for one of the juicy TUC/DTI funded UNION LEARNING PROJECT jobs in the union. Five organiser posts were advertised and filled, all by LUNITY nominees. One was not publicised except on the exclusive PCS Intranet and BIFFA expected a shoe-in as there was only one other candidate. It was only when it became public that BRYANT might get the job on promotion despite being dismissed from the Civil Service that the LUNITY grandees pulled back to avoid political embarassment. The other matter I referred to above involved CHARLIESENORMOUSMOUTH overhearing FULLER in the smoking room at FALCONCREST the week before last proclaiming that FRAUD was a thug. "You wouldn't say that if he was here" quoth McDONALD. "Oh, yes I would" challenged HOWIE. Coincidence being a wonderful thing, on leaving FALCONCREST, DREDD was confronted by FRAUD, McDONALD and a camp-following Harpy who was nothing to do with PCS. Following some light-hearted banter shared between the four, FRAUD shoved the hapless DREDD, dashing his Superhero baseball cap to the ground. Feathers suitably ruffled, FULLER has put in an official complaint about the saintly FORD's behaviour and is seeking to have him barred from all PCS premises. This should go down well with FRAUD's current employers, the Workers Educational Association - new motto "learn or get thumped"? CHARLIE is not a happy bunny, either: seeking to escape from from the monotony of DWP trench warfare, and with management hotly breathing down his neck baying for blood, the shellshocked CAUCUSITE applied to the TUC Academy for a trainee organiser post which would've got him out of the Frontline for a year. Sadly, the TUC did not fall for the transparent ruse, and have rejected his application.